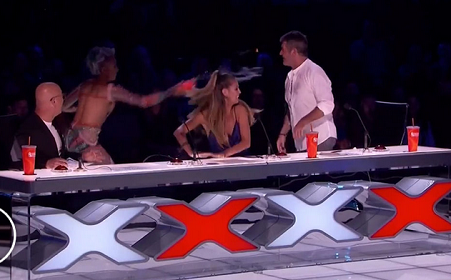 Mel B hurled a cup of water at fellow 'AGT' judge Simon Cowell and then stormed off the set in the middle of a live show, after he made a reference to a very sensitive subject - her marriage. Simon was critiquing a contestant when he began using a simile, comparing his performance to Mel B's honeymoon ... lots of anticipation, but no delivery. That was all she wrote ... Mel B smiled at first but apparently had to be coaxed back onstage a few minutes later. She's been dealing with a disastrous breakup with estranged hubby Stephen Belafonte, so it hit too close to home.